Looking for a great deal on a dumpster in Brentwood? You have come to the right place. We offer low rates and no hidden fees when you order from Discount Dumpster. Call us at 615-241-9813 and we will provide you with an affordable solution for your residential or commercial roll off dumpster. We delivery to homes, offices, construction sites, and more. Use the roll off dumpster for constitutions debris, junk removal, landscaping debris, and more. 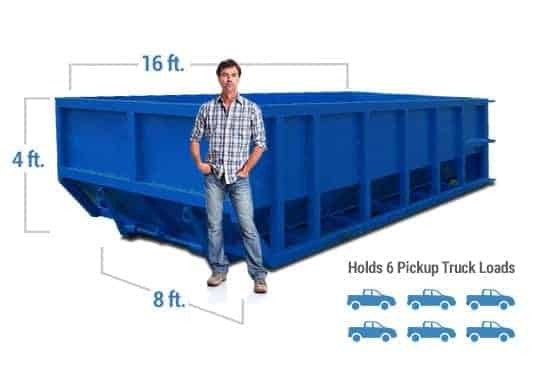 We offer multiple sizes ranging from 12 cubic yards up to 30 cubic yards. You fill it up and we will haul it off to the dump. When renovating a space or decluttering your home, our team will provide you with the roll off bin you need to help simplify the cleanup process. When you call you will be connected with a staff member who is knowledgable and will be willing to help you set up your dumpster order. It is easy to rent and you only need to be aware of the size, weight limit, and rental period. From there you are able to fill the dumpster up to the top, being sure not to go over. The quickest way to receive an accurate quote is to call our office. Who knows…we may have a special running. We offer deliveries all over town including residential homes, construction sites, shopping centers, hotels, schools, parks, office parks and more. Let us know here you need the dumpster located and our experienced drivers will do their best. All dumpsters have an open top and back gate to allow for max disposal and best use of your dumpster rental in Brentwood, TN. Not sure if you need a permit. Let us know the details of your order and we will check for restrictions prior to your order. The City of Brentwood Department of Planning and Codes charges fees for right of way permits. Be sure to check with the city as well as any home owners association before you have the dumpster delivered.